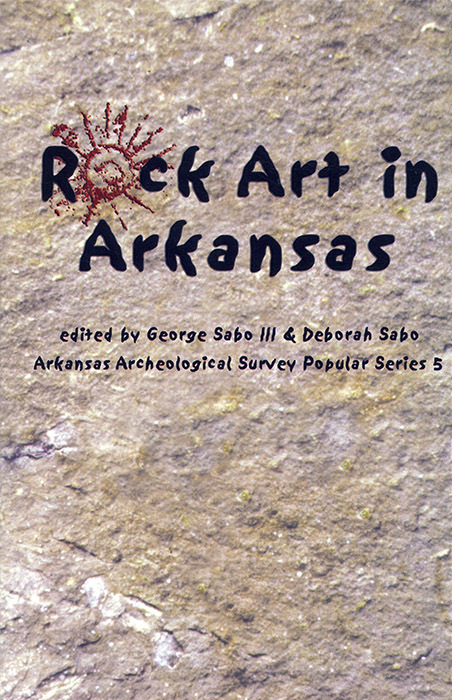 Rock Art in Arkansas, edited by George Sabo III and Deborah Sabo, with contributions by Michelle Berg Vogel and Jerry E. Hilliard, provides an overview of current knowledge about Arkansas rock art, incorporating the findings of ongoing research in a presentation suitable for general readers as well as specialists. The 146-page book has 70 illustrations (most in color), glossary, index, and bibliography. Chapters cover the place of rock art research within archeology, the history of rock art research in Arkansas, descriptive terminology, dating, diversity of site types and imagery, interpretation of rock art sites as part of a cultural landscape, and preservation concerns. Separate chapters are devoted to two of Arkansas’s most important rock art sites, The Narrows and Rockhouse Cave, with an updated assessment of the first rock art style defined within Arkansas, the Petit Jean Painted style. This book summarizes the foundation for new studies that relate Arkansas rock art to the religious and mythological iconography of the Southeastern Ceremonial Complex. Arkansas has one of the highest concentrations of well-preserved prehistoric and early historic rock art, both pictographs and petroglyphs, in the American Southeast. Rock Art in Arkansas is the first comprehensive treatment of this important cultural resource. Also visit the Rock Art in Arkansas website.